Welcome to the first of our Bouquet Inspirations by Violet! Violet is our resident wedding planner, floral expert, and now, our new inspiration sketch artist. She can come up with amazing ideas for bouquets and centerpieces with ease, so let her inspire your next creation! 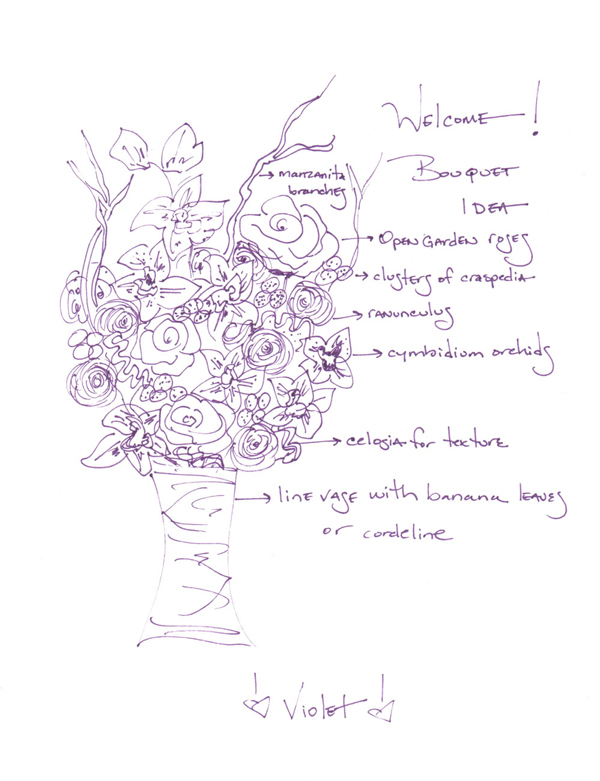 In the Bouquet Inspiration posts I will display her sketches and then post links to the flowers and/or greens that you will need. Enjoy! This inspiration is shown as a centerpiece idea but could easily be transformed into a bouquet! For a bouquet, use less (or just use the tips) of the manzanita branches, as they can add a lot of weight or bulk, or you can substitute for curly willow. Then wrap the stems with ribbon or fabric of your choice rather than placing in a vase! Make it your own by using colors that fit your palette and Have Fun!